Painted turtles are common household pets found in families that adopt reptiles or have been given a small turtle as a pet. They can be found in many pet stores around the country in various sizes and appearances. These interesting creatures are often beloved by children and younger adults and they are long lived. However, it may be difficult to determine the age of the turtle in order to have an idea of the number of years left in its life. Turn the turtle upside down where its stomach can be easily seen. 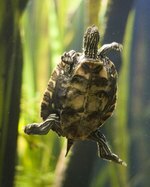 Turtles will not enjoy being upside down and might hiss, but most painted turtles will not bite when turned upside down. Be gentle to avoid hurting the turtle. Look at the abdominal area. On a turtle, this will be near the middle, but on the lower half. There should be approximately eight sections. The two abdominal areas are the third section from the bottom of the turtle. Choose only one side, either the left or right abdominal. Count the rings. The rings represent each growth cycle and can give a good estimation of the age of the painted turtle. Number the first ring as zero rather than one. The first ring is present at birth. Estimate the age of the turtle based on the number of rings. If there are five rings, one is numbered as zero and the others are numbered one through four. The turtle is therefore approximately 4 years old, having completed around four growth cycles.